Got a sluggish PC, or one that crashes? Want to make sure that your PC doesn't get that way? One way to keep your PC in top shape is to make sure that its Registry is clean and free of errors. CyberDefender Registry Cleaner ($30, feature-limited demo) peers deep into your Registry, finds potential problems, and promises to fix them for you--but it only fixes them if you pay first. CyberDefender Registry Cleaner finds Registry errors, but will only fix them if you first pay for the program. It also found more errors than another, (as of 11/27/2009) similarly priced, for-pay Registry cleaner, RegistryBooster 2010. 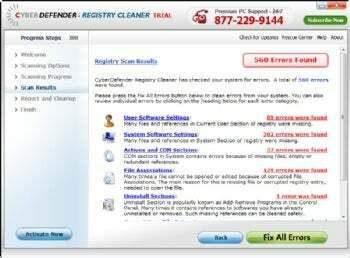 CyberDefender Registry Cleaner discovered 560, versus 132 for RegistryBooster 2010. But RegistryBooster 2010 also has some useful features that CyberDefender Registry Cleaner does not, such as Registry defragmentation and the ability to ignore certain areas of the Registry. So if you want to pay for a Registry Cleaner, it's not clear which is better--one finds more errors, while the other offers more features. Again, though, you can't really try out CyberDefender Registry Cleaner adequately, because it requires payment before fixing problems it finds.